I’m sure some of you have had this happen before where a horse picks you. It is truly an awesome feeling. The horse you see in the picture is a Section A Welsh pony stallion. I had no intention of buying him but he picked me so I took him home. 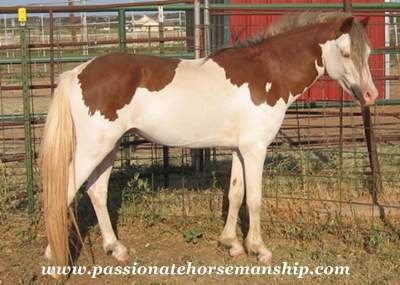 When I decided to get a Welsh pony stallion I did my research and found a Section A stallion I wanted he was a sorrel with a blaze face and 3 white stockings. I drove 5 hours to see this stallion and when I arrived I was taken out to the pasture where he was with several other young stallions and geldings. The herd was at the pond standing under a tree. We parked up on a little hill that was close to the pond. There was 4 of us in the car and we all got out. I was standing there looking at the one had picked out from the website and noticing the others in the group too. I wanted to give them a little time to get comfortable with our presence and hopefully they would move around some as I wanted to see this young stallions movement. Now just a little insight these ponies had not been handled much at all so they were standoffish. I decided to squat down and get in a more comfortable position. It was not long before I felt what I thought was someone touching me on the shoulder. I turned to see who it was and it was the stallion you see in the picture above. I knew right then that this stallion was going home with me as he had left the herd. Out of all the people he could have went to he picked me. I asked the other people if he had come up to them and they all said no he went right for you. This is the interesting part after I got him home I let him settle in for a few days then I went to work with him. Now he had never been in a stall with a run before as he was born out in the pasture and that is where he stayed. This stallion acted like he had been born in a stall at my barn, he was so willing to work with me. Like I said before this was such an awesome feeling. So tell me have you ever had this happen with a horse before? If so leave me a comment and tell me about your experience. Yes they are very smart. Thanks for letting me know that you like the tips. I appreciate you taking the time to leave a comment. Thanks for sharing your story Laura. Sounds like he was really attached to you what a great bond you had with him. Sorry to hear you lost him.